2019 has begun. Are you ready to take it by the scruff of the neck and make it your best year ever? Here’s a few small business marketing tips to help you make the most of this year. The first of our small business marketing tips is probably the one we see more companies in need of that anything else. Your time and money are valuable. If you’re spending either on marketing activities that aren’t generating leads for your business, you are wasting that money. Finding out is one of the quickest ways to improve your bottom line, because you stop spending on activities that don’t work and spend it on those that do. Here’s some numbers you should be looking at. No single company in the world tries to sell to everyone. For every product or service they provide, they have a picture of who will buy it and why. 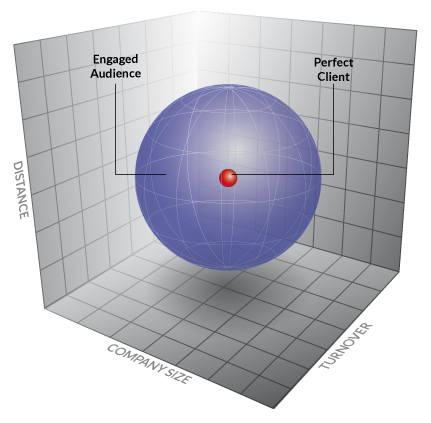 Do you have this to help focus your marketing? The more you focus, the more you will get the people you want to talk to. Unless you have a real niche focus, there are lots of people out there doing what you do. There are certainly lots of marketing consultants. To ensure that people remember you for when they need your services, you need to maintain a consistent level of marketing activity. Otherwise people will quickly forget you in the cloud of messaging they are exposed to every day. That doesn’t mean you have to communicate every day. Maintain a level of consistency that you are able to, and one that is most likely to work with your target audience. If people consume your product/service rapidly, the marketing frequency needs to match consumption levels. If you work on annual, or longer, contracts, it may be that 3-4 times a year will be sufficient. Far too many businesses open their marketing with the word we. Your target audience doesn’t want to know about you. They want to know how you are going to help them. So talk about that. You know your clients and the issues they have, so talk about that. Show you understand their issues and that you have a solution. Then people will come to ask you about how you can help them. Coffee: Meet people face to face and talk to them. Help them understand what you are looking for, whilst ensuring you are listening and understanding what they are looking for too. You can substitute beer/wine/tea here, of course! Telephones: Your phone is less than six feet from your hand right now. Whether that is your mobile or your landline, make use of it and talk to your network, so they don’t forget you. Email: we all get huge numbers of emails, but I bet you most of your network will open at least one email a year from you. Mailchimp and its ilk are great tools to keep in contact with people and keep them aware of what you are up to. Whatever way works for your business, don’t lose the referrals you can get in the future by losing touch with your network. 80% of mobile consumption is video and it’s rising. If you want to communicate with today’s decision makers you need to use video. Develop a set of short messages that show how you help your clients. Your phone is perfectly acceptable for this type of educational video, so you don’t need to invest in expensive hardware or pay lots of money for others to video you. Add them to YouTube and use your preferred social media channels to distribute them too. Make sure your network know where they are, so they can share them to increase your reach. We must admit, of all our small business marketing tips, this is the one we need to do more of ourselves – oops! Your website is your window for the world. There will be few potential clients who don’t check you out, so it makes sense for you to know who is looking at your website. Tools such as CANDDi provide you with a huge amount of information about who is on your site and what they are doing on there. They cannot identify every visitor, but they will check fixed IP addresses and give you information about the company. They collect information about the person from Contact Forms, Web Chats and when you email someone. Imagine knowing when your latest prospect reads your proposal and then checks out your case studies – buying signals or what! The last of our small business marketing tips is, probably, one of the easiest to implement. Taking on a new supplier is a big risk. If you’ve never worked with them before, how do you know they will be any good? Your prospects will be thinking this too. How do they know you are any good and can deliver on your promises? Use the evidence you have. Make sure you have testimonials scattered across your website, so people can see what their peers think of you. Case studies, including the results, are tremendously powerful. Not only does the reader get to see themselves in the description of your client, they see that they share similar problems. More than anything, they see you delivered a solution that worked. Why would they not want to work with you? Knowledge articles. Whether published on your blog or through other media channels, share your thinking with others to show them you know what you are talking about. Marketing today is all about consistency and demonstrating you can help. As a small business owner, you only have a limited budget, so make the most of it by focusing, but if you do one thing only, let it be this one: Talk to your audience about them – not about you. We hope these small business marketing tips help. If you need some assistance with taking your marketing forward, simply complete the form below and let’s talk. What does GDPR & PECR really mean to the marketing carried out by B2B companies? GDPR is nearly six months old (at time of writing). Since GDPR came into force, the Information Commissioner’s Office still hasn’t issued a fine greater than £500,000. However that doesn’t mean they are not going to. The fines issued were for actions that took place prior to May 2018 and so the fines have been the maximum possible under the Data Protection Act 1998. Do does this mean they’re not going to fine anyone? Not at all. Since the 25th May 2018, the ICO has taken 25 enforcement actions. So how can you ensure that your B2B business does not join the list? There are a multitude of regulations that impact what you can and cannot do when marketing your business to generate the leads you need to grow your business. Before May, the level of hype and, particularly, scaremongering was phenomenal. Many people were suggesting the ICO would jump on you with a 4% (or 20 million Euro) fine. The hype around consent suggested that you were only allowed to market to anyone who already knew who you existed and actively sought information. Those who have given you explicit consent are, of course, your gold dust. They want to hear from you and are highly likely to buy from you at some point. But who else are you allowed to talk to, under the different rules applicable to B2B? Your clients: allowing you to market your full range of services and products to them, so they buy more from you. The people who have talked to about your services. Just because they didn’t buy from you before doesn’t mean that they won’t buy from you in the future. You are allowed to market to companies, but you have to get consent from sole traders and individuals. When marketing to companies, you need to make it very easy to opt out and allow individuals to opt out. Keep a list of the people who opt out of your marketing, so you can check any lists your acquire against that list. Screen your list against the Corporate Telephone Preference Service (CTPS) – assuming you are following up your marketing. Once you have your data, it’s a case of common sense. Only use the data provided for marketing purposes and delete any additional data provided by the list provider. Only send them marketing communications that are relevant to them. Don’t send them too much. However relevant your marketing material, sending loads of email will annoy them, so they unsubscribe. Tell people how you obtained their data. So when you start worrying about what you can and cannot do, think carefully. Be sensible about who you send email marketing to. Of course you should concentrate on developing a marketing list of people who have asked for information and opted-in to receive your marketing messages, but you can market to others in order to generate the leads you’re looking for to grow your business. What about your current list? Remember before the GDPR deadline when everyone tried to get you to get your mailing list to re-subscribe? There were lots of people providing advice around this. For those of you who did this, how many people actually responded? We’ve not seen any stats for re-subscribe rates, but stats for click-through rates (they need to click through to re-subscribe) at an average of 1.9%, that means you were throwing away up to 98% of your mailing list if you followed this advice. Not a great idea! To us, it is about whether people think your content is useful. The easiest way to see this is the level of opens and clickthroughs that take place. Luckily, most email marketing platforms check this and give each subscriber a rating. Mailchimp’s Member Rating is a five-star tool. Put very simply, the more stars, the more they are engaging with your email marketing. Remove those you aren’t interested. The people on your list with two stars or less aren’t reading your emails and so shouldn’t be on your list. If you have a big list, this data is costing you money to keep and your emails to them are being ignored, so take them off your list and reduce any risk of being reported. Try different times. If you always send your emails at 9am on Tuesday, your best performing time will that just that. However, there may be better times of the day and week. Hubspot suggests 11am is a great time, but it may vary for you. Try it and compare the results. Use different layouts. The more images you have, the lower the open rate as a general rule. However this may not be the case for your audience. Try different layouts, including simple text, to see what your subscribers prefer. Use Version testing. Whether you call it split testing or A/B testing, most email marketing tools provide this as standard. You can test different subject lines, different content, different sender names and times. Email marketing is one of the most effective ways to talk to a lot of people concurrently and to keep your target audience engaged. You do have to follow the rules, but you have to follow the right rules. What marketing resources do you need? You are passionate about what you do. If you weren’t you probably would be doing something else right now. You can talk for hours about the minutiae of your business and I bet you could write a book of acronyms. However, knowing how to translate your knowledge into what your prospects want to hear is something different. Being sure you are using the right marketing tools, and using them in the best ways is another issue. There’s nothing wrong with this. You cannot be expected to wear every single hat and know everything about everything. That is why large companies have their own dedicated marketing teams – to bring that knowledge into the business. If your business is really young, and you haven’t got investment funding, you have little choice but to do most of it yourself, but you could us a part-time or virtual marketing director for just a few hours per month. They become a source of advice, guidance and support for a small investment. 49% of small business owners aren’t sure if their marketing is effective (Leadpages) and 14% know that they aren’t. 67% of small businesses who use SEO as part of their marketing mix in-house and external resources (Statistica). The old adage of “why work 40 hours a week for someone else when you can work 80 hours a week for yourself” shows just how much time is needed by a small business. You may be doing a full week simply delivering on your clients’ needs. Unless you have a Time Turner (you have seen the Harry Potter films, haven’t you?! ), you cannot do two things at once. That means working more hours. Employ someone, but do you have the funds available to pay them and the time available to manage them? Outsource your marketing. You still need funds, but you can balance the funds and your time so that it works for your business. Don’t do any marketing. This is the case for half of all small businesses, as they do less than two hours per week (Statistica). Time and money go hand in hand here. They also then impact on the knowledge. You may think that you haven’t got the money to pay to outsource your marketing. But if you don’t outsource, in order to get the knowledge and the time, you’ll not get the money. This is where opportunity costs come into play. If you outsource your marketing, can you earn more money, than it costs, in the time you save? Remember: 79% of small businesses buy they best they can afford, not the cheapest (CEB Globa). If your marketing shows just how good you are, your target audience will buy from you. The other thing to consider when outsourcing your marketing is the investment you are making. Marketing is a medium to long term thing. You don’t get a return on investment the next day (unless you’re really lucky) so you have to be able to spend the money now in order to reap the rewards further down the line. The balancing of time, money and knowledge is not easy. If you haven’t got the money, you can’t get the knowledge and the time needed to make you more money. However, you can start small. Test the waters, using some like us as a marketing support provider. They help you do the best job you can, helping move you to the point where you have the money to outsource the marketing so you can concentrate on doing what you love. Give us a call if you want to discuss this in more detail. We hope this helps. https://smeneeds.co.uk/wp-content/uploads/2017/01/SMEneeds-Logo.gif 0 0 nigel davey https://smeneeds.co.uk/wp-content/uploads/2017/01/SMEneeds-Logo.gif nigel davey2018-06-26 06:51:312018-06-14 16:09:31Do you have the resources you need to deliver your marketing plan? Should you bid on your company name?